This was an unfortunate provocation, not to say a bit of gratuitous guile, because some who read it still hated it, and some who hadn’t read it surged with mitre-licking adulation. Others still gave it a thoughtful and considered critique, but we don’t exist in Sentamu’s cosmology: if you are not for him, you are patently against him; if you don’t agree with him, you hate him. The main challenge on tax, and public spending, is that we don’t really have enough tax to pay for all the things we want to do together. This week’s debate on public sector pay has demonstrated that there is little sign of a coherent plan about how to fund the health service, education, social care, defence, housing, or transport infrastructure. Proposed solutions pit one section of society against another to provide the funds – either by cutting public spending for some, or increasing taxes for others. Surely the nature of communal action is that it is precisely action taken together. Members of Synod, to serve the common good, how many of us would be prepared to top up freely our income tax from our net monthly take home pay for Education, Health, and Social Care? Please let us have a show of hands. We are among the 48% who, according to the British Social Attitudes survey (British Social Attitudes survey 34, NatCen), wanted higher taxes to pay for more spending on those three areas of the common good. After his request for a show of hands, a majority of palms waved in adoration, which permitted the Archbishop to proclaim to the world (or the 12 watching via YouTube) that members of the General Synod of the Church of England are among the 48% of the country who would like to pay more voluntary tax. However, when this was put to an electronic vote, Synod voted not to include the Archbishop’s proposal as part of their response to the current economic climate. This suggests a Synod of hand-raising hypocrites, for they love to be seen by others as being supportive of ‘common good’ notions by being willing to pay more voluntary tax, but in private they are of the view that what’s theirs is theirs and they don’t want the state to take more, nor do they particularly want to give the state any more. Truly, they have received their reward in full. This was all very embarrassing for the Archbishop: an unforced error; a bit of an own-goal. But it is also very odd. There is absolutely nothing stopping the Archbishop of York writing out a cheque to HMRC and gifting the Treasury any number of hundreds or thousands of pounds of his own money (or the money he cares for “as part of the whole human resource for our social flourishing”). They will surely cash his cheque and thank him very much for his voluntary tax. They might not spend it on the sort of social flourishing the Archbishop has in mind, but they will certainly grab it with both hands as a national resource to apportion as the government sees fit (Trident renewal, HS2, Hinkley Point C…). Anyone anywhere in the UK can pay more voluntary tax if they wish, and Christians have more justification than most, for it all belongs to Caesar. 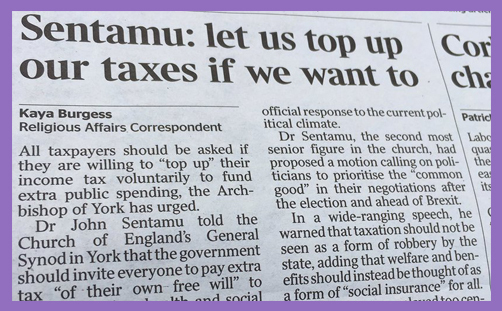 But would it not be preferable to give the Church a voluntary tithe rather than the Treasury a voluntary tax? ‘Every man according as he purposeth in his heart, so let him give; not grudgingly, or of necessity: for God loveth a cheerful giver‘ (2Cor 9:7). There’s no point at all letting the bishops, clergy and laity see your hand waving in the air if you haven’t determined in your heart to give freely and cheerfully: ‘…and thy Father which seeth in secret shall reward thee openly‘ (Mt 6:6). But if you don’t quite trust the Church to handle your cash (or the cash you care for “as part of the whole human resource for our social flourishing”); if you think they might siphon it off to a mission project led by a Muslim or some non-judgmental programme of never-ending inclusion, there’s absolutely nothing to stop you from giving your local school a thousand quid, or the local hospital, or the local library, or the youth centre, residential care home, or day centre for the elderly or disabled, or any new community project you decide. There’s nothing stopping you from voluntarily financing a Macmillan nurse to help someone cope with the loneliness, pain and impact of cancer. There nothing stopping you from voluntarily financing a dogs’ home or a cats’ home or an animal shelter that heals and cares for God’s abused and injured creatures. It’s called charity: some might call it the ‘Big Society’. But don’t call any of this ‘taxation’, for it is not a voluntary tax to fill a Treasury black hole, but a gift to complement a social enterprise over which you have complete control. Whatever the Archbishop of York might believe or teach, it is your money. The cause you support is based on your choice of merit and your judgment of virtue, arising from your conscience of discernment and compassion. And the less the state takes in statutory taxation, the more you get to keep and freely give as you wish. So please don’t be lured by the archiepiscopal statist air that higher taxation = greater social justice = what Jesus wants. He wants you to give freely as your heart desires, for God loves a cheerful giver.